Semi-permanent paint protection that looks amazing! Optimum Gloss-Coat is an advanced polymer system that forms a clear coat like layer of protection to your paint! Formulated by the great Dr. G, Gloss-Coat is similar to the clear coat that already exists on your vehicle. The difference is, this coating forms a shell of protection that is glossier, slicker, and less prone to wash-induced swirl marks and marring. Gloss-Coat adds an amazing level of gloss and depth to the paint that will have rain forming tight little beads and rolling off the surface! Once the surface is protected with Gloss-Coat it will be considerably easier to clean and maintain compared to conventional waxes and sealants. Gloss-Coat is not recommended for application on glass, however it works great on your paint, wheels, plastic trim, bumpers, aluminum and chrome. For application tips take a look at the complete breakdown below. Gloss-Coat is all you need to protect your paint but if you like more shine and protection feel free to top it with your favorite sealant and/or wax! If you are looking for a great protective coating for your car the Optimum Gloss-Coat is a great choice! Optimum has discontinued Opti-Coat 2.0 and replaced it with the similar Gloss-Coat. Therefore the product reviews, videos, guides, etc. before this date are referencing the previous version. The 10cc syringe is perfect for 1-2 applications on an average size car. If you are looking for multiple applications, the 20cc size is perfect. I feel Opti-Coat is revolutionary for both consumers and the detailing community. By offering this product to our clients we are, in a sense, offering a renewable clear coat, but with much better properties. I've been using this information to help sell Opti-Coat to my clients for a while, but it is especially important for clients with new cars sporting very thin OEM paint (80-90 microns). Even though this is a permanent coating, I really don't try to sell it as such. Instead, I educate the customer about the product and highlight the benefits, including that future polishing will remove less OEM paint, since the majority of light swirling and marring will be in the coating. I also like to explain that Opti-Coat offers increased UV protection to replenish the small amount potentially removed during polishing. My first impressions of this product are mostly positive as I feel Optimum has succeeded in improving several characteristics of their consumer based coating. 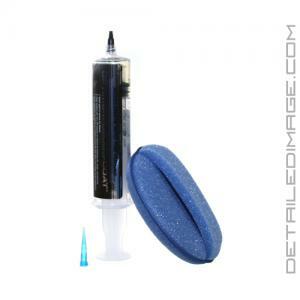 Gloss Coat is very easy to use, looks great, and has a nice slick feeling... Ultimately, Gloss Coat should be another great option for the car owner who is seeking an easy to use paint coating to protect their vehicle from the environment. Polish paint with Optimum Hyper Polish to remove any defects. Remove polish residue and prepare surface for coating using Optimum Paint Prep. Apply 8-10 drops of Gloss-Coat to the supplied foam applicator pad per panel. Wipe Gloss-Coat onto one panel at a time in an overlapping circular motion. Wait for 60 seconds after application to allow the coating to cure. Inspect the panel with adequate lighting to find any high spot or streaks. Use the foam applicator or an Optimum Edgeless Plush Microfiber Towel to even out any streaks or high spots. This step is very important and must be done within 60-150 seconds after application as any spots not leveled will have to be polished if allowed to fully cure. Panels will feel a bit tacky after 3 minutes from application as the Gloss-Coat cross links and bonds. Repeat steps 3-6 for each panel where application is desired. Not recommended for glass. First time using it. I bought to coat a new set of wheels I purchased. Application was easy and I hope it lasts as long as it says it does. I applied Gloss Coat to 2015 Nissan Rogue in Jet Black - application very easy, just make sure you have some sort of inspection light (250 or more lumens) to be able to see any "high" spots that need light towel buffing. If you miss them don't freak out, but polish lightly (i.e., Optimum Hyper Polish with a LC white pad, or similar) to fix the spot, and then reapply. Highly suggest applying a 2nd coat - this is just as easy as the first coat, just make sure to wipe with Optimum Paint Prep before application so that you have a very clean surface. The 2nd coat makes subsequent maintenance much easier and give you more protection against bird bombs, bugs, etc. I use both Optimum No Rinse, and Wolfgang Uber Rinseless Wash as maintenance agents - I like Uber better for getting bugs off the front bumper fascia. Both ONR and Uber work even better on Gloss Coat than on wax - dirt much easier to get off and I can use lighter pressure = less swirling. Also, I use Paint Prep when I want to get the Gloss Coat super clean again, then I use Gyeon Cure to give it some additional protection and gloss. I am not afraid to re-polish spots which get damaged/scratched, and then just clean with Paint Prep and another coat of Gloss Coat. My front fascia has lasted approx 2.5 years and is still making it very easy to clean off bugs. After two years of using all waxes under the sun (ChemGuys 50-50, Wolfgang Fuzion, Collinite, etc) I have stopped wasting time waxing - Gloss Coat is the way to go - the hood is the "last man standing" because I still love to wax, I just don't want to do the whole car anymore - and Gloss Coat is better defense against swirls cause by getting road grime on lower side door panels. Try Gloss Coat on a front bumper to see how much easier it is to maintain against bugs, then make a decision on the rest of the car. Great entry level coating. Just don't run around telling everyone you have Opti Coat Pro because it isn't anything like a permanent coating.